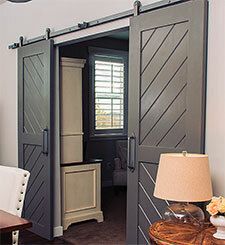 Barn doors are rapidly growing in popularity as a unique way to cover a door opening. Barn door hardware adds decoration to a home, while creating a sliding door system that will save room space compared to a normal swinging door. Barn door hardware comes in a variety of designs and choices to achieve the perfect looking barn door system to fit the decor of your home. 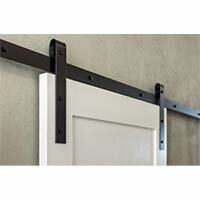 Barn door hardware typically consists of a track, hangers, and a handle. Our barn door tracks are complete kits that include the track, hangers, and other screws, nuts, and bolts for assembly. Barn door pulls are a separate item for you to select and are offered in a variety of styles. Barn door tracks are mounted above your door opening, situated so when in the closed position the door (or doors) will cover the entire opening. Barn doors can either be hung with a single door, or as a double-door configuration. Browse our barn door hardware and start moving forward on your barn door project today. If you are in need of doors, please visit Homestead Doors, Inc.